How are you doing on your 2019 New Year’s resolutions? By now, most of us have an idea of whether we are sticking to, adjusting or abandoning our personal resolutions. But, did you make professional resolutions? 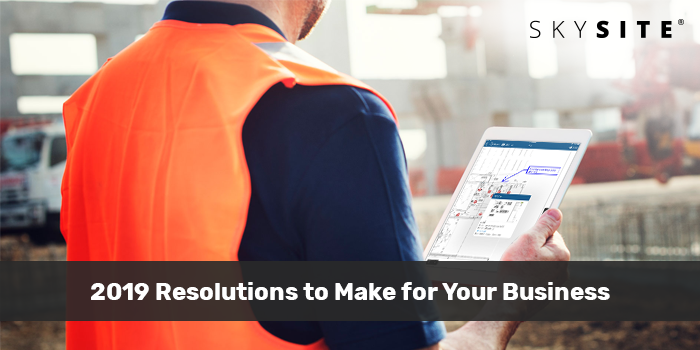 Whether you’re on track or have already given up your personal resolutions, we have 7 ideas for industry related resolutions, and it’s not too late to get started! We’ve written about the labor shortage before, and it doesn’t seem to be slowing down. As this continues, it’s important to look beyond the usual and increase your options by hiring from diverse backgrounds. Look at sources not usually on the radar for your recruiting, such as people looking to make a career change, as well as people that have transferable skills that translate to your business. Most importantly, look for people who are a good fit for your company culture. Everyone knows safety is important, but have you really made it a priority? Safety starts with leadership, from business owners, project managers and supervisors on down, to become intrinsic to company values. Not only must top management lead by example, they will need to designate resources, people, budget, technology and time for training and continuing evaluation. All team members, starting from the top, need to participate to emphasize the importance of safety and make it a successful imitative. Whether you are new to using technology on the jobsite, or an early adapter, there are new options available to help you and your team be more efficient and productive. If you’re just starting out using technology, a good place to start is with one of the many construction project management software options. These apps allow you to manage projects and collaborate with your team in real time. The result is improved productivity, better communication and fewer errors and rework. If you’re already seasoned using construction management software, delve deeper and explore augmented reality, BIM and drones. Also, for the tech savvy, start researching the future: robotics and autonomous vehicles. Now is the time to invest in staffing for the long term. This involves two components. First, become a mentor. Find local opportunities to educate the future workforce about the industry, opportunities and options. Perhaps even offer an apprenticeship program. Second, create a succession plan for essential roles in your company. Identify potential gaps in knowledge and invest in training and leadership development to ensure your company has the skills and depth as your company grows. According to the World Green Building Trends 2018 report 47% of those surveyed expect more than 60% of their projects to be green by 2021. What is causing the change? While there is still a perception that sustainable building materials and fixtures are more expensive, the costs have steadily been coming down due to increased demand, allowing sustainable products, such as steel beams made from recycled metal, to be incorporate more and more into everyday design. You can take it to the next level by educating owners on the importance of sustainable materials, as well as working with vendors to increase their green options. It’s easy to fall into the trap of being “too busy” to attend classes, but it’s important to stay on top of trends, technology, and techniques. Check out ways you can stay up on the industry and industry practices. Conferences are a great way to learn, network and even meet some of the vendors of industry products. If you’re crunched for time, look for online courses. Whatever way works best for you, continuing your education not only keeps you up to date on the industry, but it could help you advance your career. Today there’s an incredible amount of data available to help you make informed decisions for your construction project. The information can help you set strategies through accurate and efficient planning and design. By making well informed decisions, you’ll boost the efficiency and safety of your project. For example, using these systems you can capture historical information and benchmark estimates, bids, budgets and schedules. Of course, making the shift to digital data requires an organizational commitment and learning curve. However, the efficiencies gained will be worth the effort. As you evaluate that status of your resolutions, take the time to make some professional ones and decide what you’d like to implement in 2019.